This past summer the Committee for the Historian of the Orthodox Presbyterian Church republished a series of popular lectures delivered by Dr. Edward J. Young (1907–1968), professor of Old Testament at Westminster Theological Seminary in Philadelphia from 1936 until his death. Dr. Young delivered these talks, entitled "The God-Breathed Scripture," at Grace Theological Seminary in 1966. Paul is not asserting [in 2 Timothy 3:16] that Scripture is inspiring, true as that may be, nor is he declaring that something has been breathed into Scripture. What he is saying is something quite different; what Paul is maintaining is that the Scripture itself is God-breathed. That which God breathed forth from His mouth is Scripture. To put the matter in slightly different terms, Scripture is the Word, which God has spoken, the product of the divine breath. Dr. Edward J. Young was one of the greatest Christian scholars I ever met, and one of the godliest Christians I ever met. I came to Westminster Theological Seminary in 1964 for postgraduate work. I had just completed a master's degree at Princeton and was tired of the liberalism that seemed to permeate all the lectures and grading. The Committee for the Historian of the Orthodox Presbyterian Church has commemorated the one hundredth anniversary of the birth of Edward J. 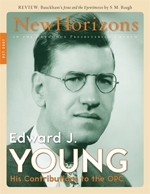 Young (1907–1968) by reprinting a series of lectures given just two years before his death on the doctrine of Scripture, entitled The God-Breathed Scripture. The lectures, presented in an engaging and lucid style, offer great insight on a number of topics pertaining to the doctrine of Scripture and showcase the theological competency of a top-tier Reformed Old Testament scholar.